This classic chocolate crepes recipe can be whipped up quickly and filled with just about any dessert-oriented food. 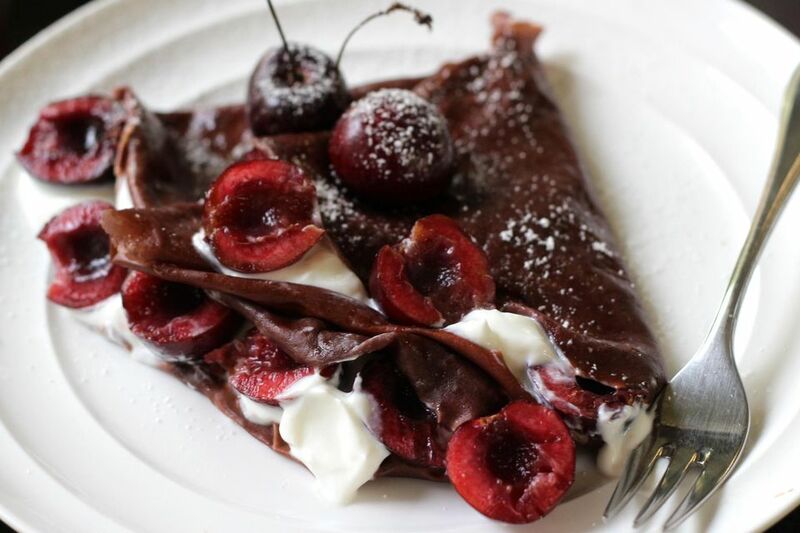 Try using combinations of nuts, fruit, and sauces for your own unique crepes. To make an intensely rich dessert, layer a few berries with homemade whipped cream and shaved chocolate. Enjoy! Whisk all the ingredients vigorously until the crepe batter is completely smooth; allow it to rest in the refrigerator for at least 20 minutes before making into crepes. Melt a little butter in a crepe pan or large skillet over low-medium heat. Add 3 tablespoons of batter to the pan and swirl until the bottom of the pan is covered with batter. Cook the crepe for 1 minute, or until the crepe is slightly moist on top and golden underneath. Cook for 1 minute and transfer the cooked crepe to a plate to keep warm. Repeat with the remaining batter.